This past Monday, I met him… and one of my dreams came true. I was invited to this intimate party, which was held in the Oak Room at the Algonquin Hotel in New York City, by my dear friends, Shaynee Rainbolt and Terese Genecco, who had been invited by yet another talented singer, Pamela Luss. I had met Pamela, who is married to Will Friedwald, when I interviewed her for Cabaret Exchange (now NiteLife Exchange) oh so many years ago. This party featured performances by an illustrious line-up of cabaret and jazz singers, like K.T. Sullivan, Barbara Carroll, Pamela Luss, Barbara Fasano and Eric Comstock, just to name a few. Will, who was acting as MC, said at one point, “People keep asking me, ‘Is that Tony Bennett sitting over there?’ and I keep telling them, ‘Yes, it is. '” Then Tony stood up and crowd applauded. For the rest of the night, all I could think about was how I was going to dart across the room and meet him after the show. 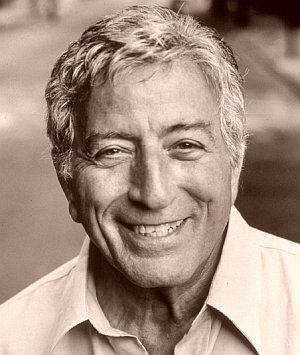 Honest to God, Tony Bennett has been my idol for almost 12 years now. I’ve listened to almost every album, read his autobiography (which was co-authored by Will Friedwald. That’s how they met and became friends), watched every music video and TV special, and celebrated him on his birthday. I’ve only seen him perform live once, at the Sonoma Jazz Festival. He was captivating, hip and spot on. I’ve been so inspired by the evolution of his career, his voice and his style. Starting out as an Italian crooner with a clear, legato voice in the bel canto tradition, he used to sing popular love songs of the day, like “Because of You” and “Blue Velvet.” But he got hooked into jazz, loosened up and started swinging, backphrasing and developing his own distinctive voice and style. As he’s gotten older, he’s only gotten better. His voice has more grit, guts, soul… and power! But he is always in service to the song, not the sound of his voice. He honors the intregrity of the original melody when he improvises and always lets the lyric guide his phrasing, dynamics and mood. He’s hip. He’s hot. He’s a jazz cat! He’s also a good, kind, generous person. And that shines through everything he does. On a more personal note, I suspect my deep love for Tony Bennett comes from what he’s taught me; that it’s possible for a singer who started in a more classical, sing-it-as-it’s-written style, then successfully move into the freedom of jazz and personal interpretation. He’s shown me that, yes, your voice can get even better as it gets older! It can become more distinct, honest and revealing while keeping its power and stamina. And you can still perform with grace, energy and style at age 84! He is one of my musical heros, and I feel so blessed to have shaken his hand, looked into his eyes, and told him how much he’s meant to me. November 8, 2010. A day I’ll never forget. May I quote you – you say what is important for all singers to know. Part of “how to make a song your own.” To appreciate what you have and to work with that. So very very nice you met the man in person. You were very very well prepared… takes one to know one.